While my mother, four siblings and I escaped Pol Pot’s Cambodia in 1976, my father died of dysentery and malnutrition after a brief stay at a mite-infested Khmer Rouge “hospital.” Although I have harbored grave doubts about the ability of the Khmer Rouge Tribunal underway in Phnom Penh to punish the guilty, I hoped for the best and even filed a civil complaint with the Tribunal’s victims unit last year. But I can no longer in good conscience sit back in silence and watch this theater of the absurd. 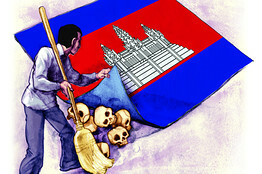 As with so many other donor-financed projects, the Tribunal—set up in 2006 to bring justice to millions of Khmer Rouge victims—has been mired in an endless stream of corruption and mismanagement allegations. The latest news came on August 11, when Uth Chhorn was named to the court as an independent counselor. Mr. Chhorn is Cambodia’s auditor-general and heads the seven-year-old National Audit Authority, which is supposed to audit the government’s activities. It has yet to make a single report public. His appointment was sanctioned by the United Nations, which manages the court alongside the Cambodian government. This news is only the most recent window-dressing in the Tribunal’s brief history. In February 2007, a kickback scheme was exposed by the George Soros-funded Open Society Justice Initiative. Two years and seven international investigations later, basic questions of accountability remain unanswered. The Cambodian authorities have stonewalled and denied wrongdoing. Confidence in the Tribunal was further shaken by the resignation in May of Keat Bophal, the Cambodian head of the victims unit and an experienced human-rights defender. She was replaced on May 18 by Helen Jarvis, an Australian citizen, in a move to “strengthen” the Tribunal. Several years ago Ms. Jarvis was awarded Cambodian citizenship for her many years of loyal service to the authorities. “We too are Marxists and believe that ‘the ends justify the means.’. . . In time of revolution and civil war, the most extreme measures will sometimes become necessary and justified. Against the bourgeoisie and their state agencies we don’t respect their laws and their fake moral principles.” Ms. Jarvis refused to comment publicly about the letter. At a June 10 press conference, a U.N. legal communications officer said that Knut Rosandhaug, deputy director of the Tribunal and coordinator of U.N. assistance to the Tribunal, “fully supports the appointment of Dr. Jarvis as the new head of the victims unit.” Never mind victims, their concerns, and their rights. To be sure, a coterie of other left-leaning academics and contemporaries of Ms. Jarvis were to varying degrees little more than apologists for the Khmer Rouge during their reign of terror, including the late Malcolm Caldwell and linguist Noam Chomsky. At the time, Mr. Chomsky hedged his statements of support for the Khmer Rouge with caveats that could later provide plausible deniability. But he and others praised the work of Caldwell and Khmer Rouge groupies George Hildebrand and Gareth Porter whose “Cambodia: Starvation and Revolution” (Monthly Review Press, 1976) ranks with Walter Durranty’s New York Times coverage of Stalinist Russia. Although the Tribunal has shuffled personnel, the wrong people are leaving. Ms. Keat’s exit deprives the court of both credibility and a passionate defender of victims’ rights. International co-prosecutor Robert Petit will retire from the court today because of obligations to return to work for the Canadian government. Mr. Petit gained acclaim for insisting that the Tribunal try more than five individuals—contrary to the Cambodian authorities’ wishes. The bungled testimonies in mid-July of witnesses such as a nurse and a deputy head of S-21, a notorious Khmer Rouge torture center, were an embarrassing comedy of errors for the Tribunal’s judges, lawyers and victims alike. The record of the past two years suggests the Tribunal isn’t serious about delivering real justice. The best way to correct this course is for the court to reboot with a new set of personnel, including the director of administration, deputy director and head of the victims unit. We, the victims, deserve no less. Mr. Ear is an assistant professor of national security affairs at the U.S. Naval Postgraduate School in Monterey, California.